NOTE: an astute reader noticed a big error on my part. 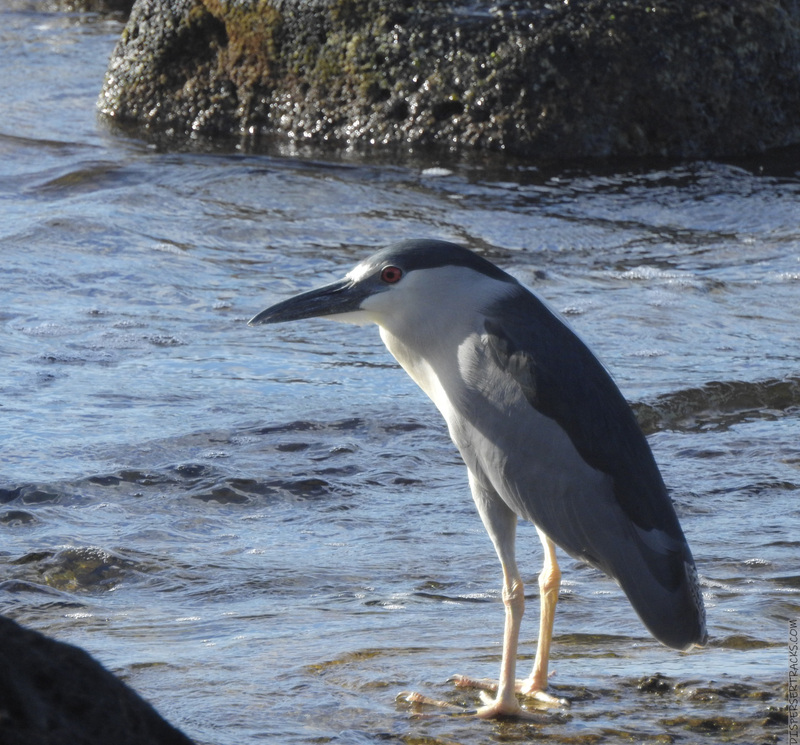 In my rush to get the post out, I misread the identification of the bird . 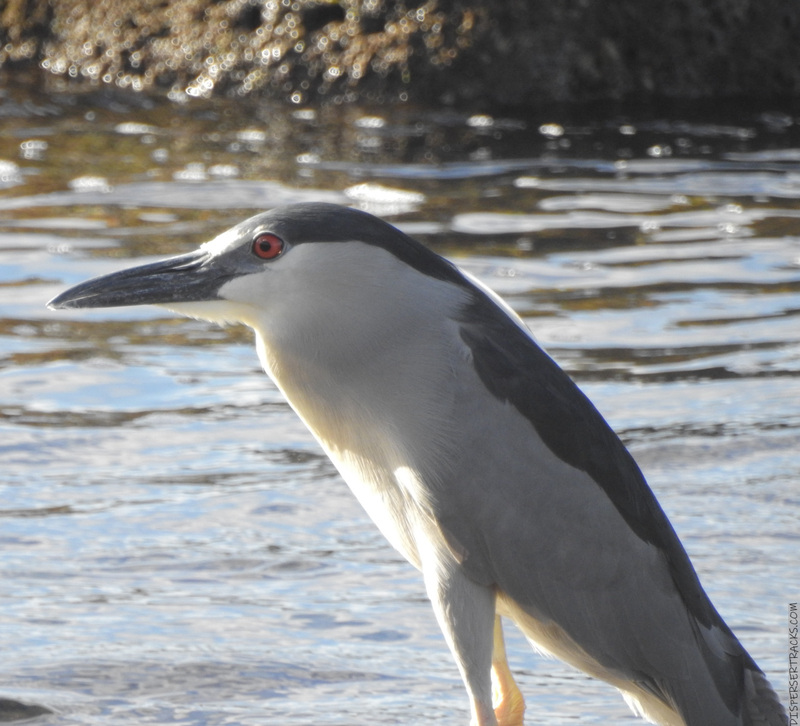 . . it’s not a Cattle Egret but a Black Crowned Night Heron. Sorry for the confusion. By the way, you can click on the photos for a larger version. There’s also a gallery at the end of the post. A recent comment had me realize people have different preferences when it comes to post-processing a photo. I mean, I knew that. People differ in what they consider striking, attractive, beautiful, bland, ugly, and so on. What struck me about the comment was the preference for the unprocessed photo over the version with my processing applied. As a reminder, I usually reduce the in-camera processing to the very minimum I can get away with. I do that because in the case of RAW output (Nikon DSLRs) I can do any manipulations I see fit to my heart’s content. In the case of the P900, it only outputs JPG files . . . and I prefer getting as close to an unedited version as possible. The processing done in-camera makes decisions I can’t reverse. I mean, I can season to taste, but I wasn’t the cook who prepared the meal. So, for instance, the above photo seems (to me) bland an uninteresting. Not awful, mind you, but I prefer a bit more punch in my photos. So . . .
Again, that’s my preference . . . but I would have imagined that would be the preference for nearly everyone. Apparently, that’s not the case. Too bad, that, because I don’t typically show unprocessed versions of the photos I shoot. At the very least, I crop for composition. In fact, the “originals” in this post all have some cropping. Mind you, one need not just think of color when contemplating sharing a photo. Nearly every photo requires different processing because zooming in (or out) will usually change the amount of light and hence the exposure. Yes, yes, were I a professional, I’d make sure each and every photo is “properly” exposed . . . but I’m not and I don’t. 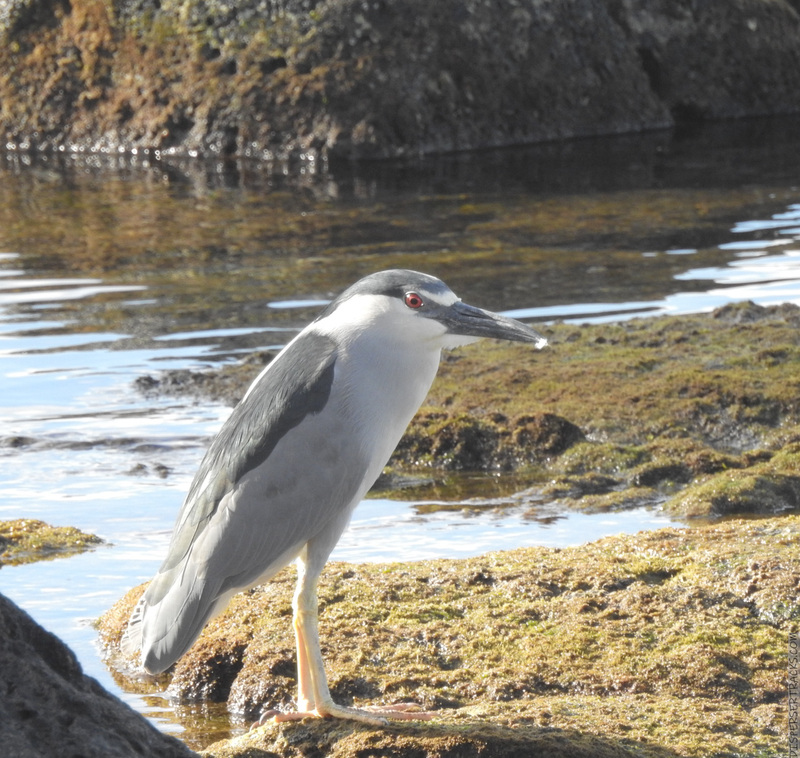 So, here is a shot of the same bird but zoomed in a bit more. I should mention one other thing . . . I was shooting against the light. Meaning, the sun was high and behind the bird and I’m metering on the bird so it tends to wash out some of the surroundings. Ideally, the sun would be behind me and the scene would then be a bit more “vivid”. Like, perhaps, this . . .
. . . but not quite because, again, the back of the bird is reflecting a lot of direct sunlight. I have other tools I can use. For instance, using onOne Photo Effects 10.5 I get this . . .
I’m sure there are photographers who can use two different tools and get the exact same version of the finished product . . . again, that’s not me, Bob. 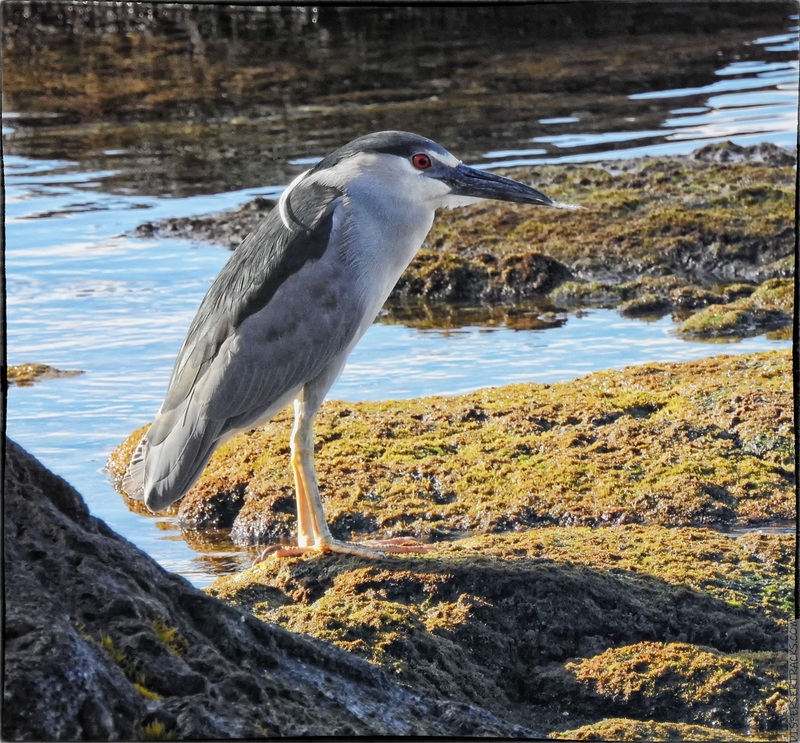 Hence, two different programs produce two different post-processed photos. I have a few more tools and were I to use them, each output would vary slightly from the others. BUT . . . they would be pretty close because I have a preferred “look” and “feel” I’m shooting for and the tools — while not exact — are close insomuch that they adjust the same stuff. And, of course, there’s always B&W . . .
Alas, even the B&W will vary slightly from photo to photo. Additionally, B&W processing has different looks available. 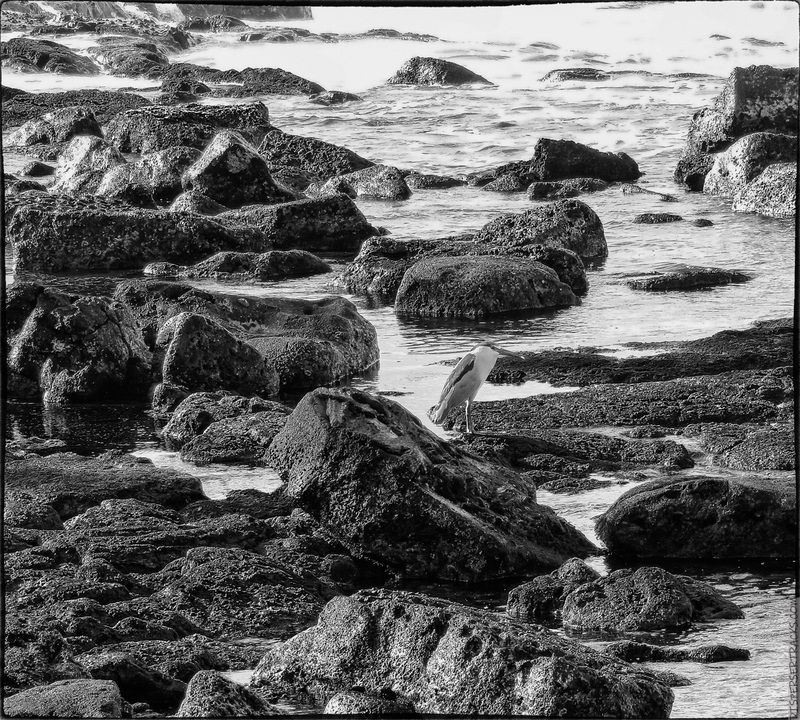 I mean, colors also have infinite ways they can be shown, but I think B&W photos have a greater latitude when it comes to showing different processing and, you know, still look B&W. There’s another thing that’s to consider when processing photos; ambient light. Ideally, I’m in a darkened room and using a calibrated monitor and if the ambient lighting changes, my connected colorimeter will adjust the color profile to ensure I see the same thing no matter the ambient lighting. Except, I don’t keep the colorimeter connected to the computer. I try to keep the level of light in the room about the same, but even then, daytime light is different than evening light. It’s not as much of a problem with modern backlit displays, but it can affect how things look.
. . . and I have no idea where and when and on what readers will view the offered photos. I covered some of that in the recent posts about color and B&W photography processing on my laptop. Anyway, back to the bird . . . I mentioned zooming in . . . that’s easy. Zooming out offers it’s own unique challenges, especially when the sun is high. 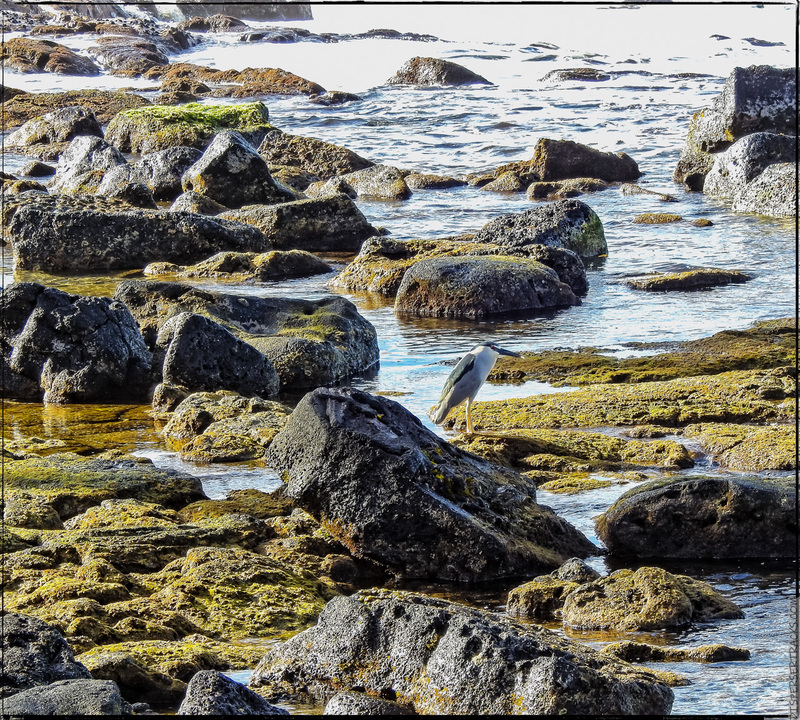 The reflection of the water, the brightness, the high contrast between the lava, algae, and water all ensure the bird disappears as a subject. With a RAw photo, I could do a lot more; with a JPG, I’m limited and without getting into burning and dodging different parts of the photo, this is about as well as I can do and still keep the scene fairly “natural looking”. I’m not happy with either of those. Again, if I were on the other side of the bird, it might be a bit easier, but it would still be a difficult scene process. I’m sure there be people out there who could take this and work their magic to make it look splendid . . . still not me, Bob. I wouldn’t normally share this photo (shot at a 240mm 35mm-equivalent zoom) and the only reason I’m sharing it now is to make a point. Namely . 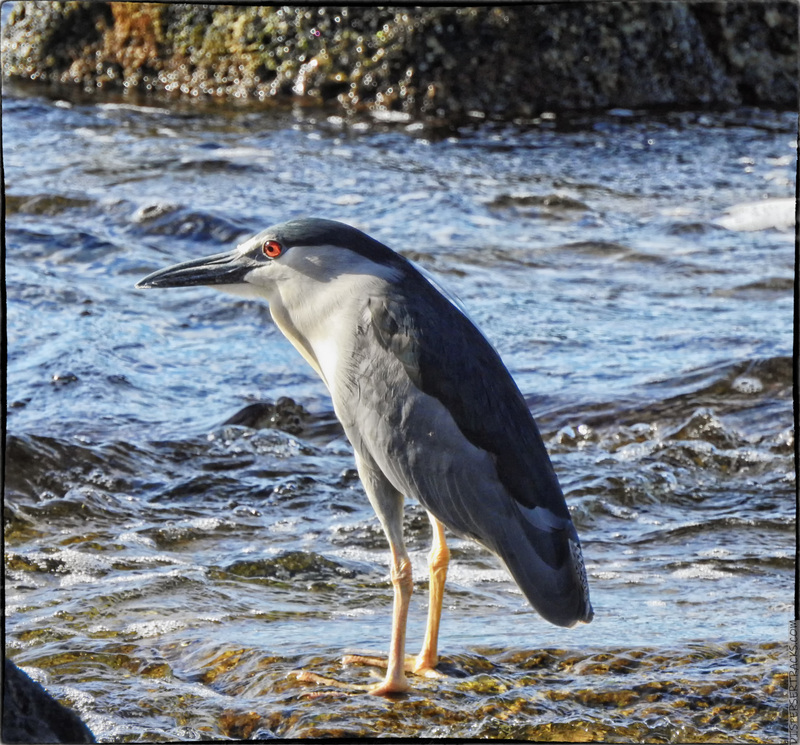 . . the P900 offered a shooting opportunity I would not have had with the D7000. On the one hand, I’m happy I got these photos . . . on the other hand, I wish they were higher resolution, better color-balanced, and output in RAW. You can’t have everything (without spending a crap-load of money). Oh, yeah . . . B&W. Between the four, I’d have to give a nod to the B&W. Not so much because you can see the bird any better, but the rocks are more interesting in B&W. Anyway, let me post five more photos (original, color-processed, B&W processed) and talk a bit about what I’m thinking when I process them. Before I do, a short comment about the bird itself . . . it always looks like it’s . . . well, twisted. The body, legs, and head never seem as if they are quite lined up and where they are supposed to be.
. . . perhaps it’s just me . . . Anyway, I mentioned I metered on the bird. Well, yes and no. The bird is next to lava and I wanted to get some detail on the lava. That’s one of the reasons (besides the lighting conditions) the scene is so “bland” . . . I’m letting in a lot more light so I can hopefully get detail on the rocks while minding not to blow out the highlights. 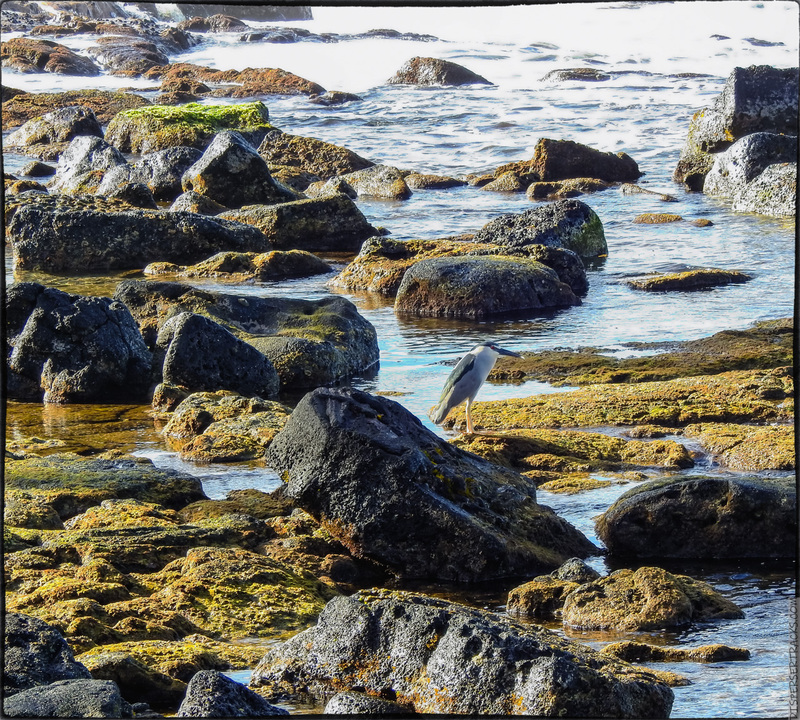 When I process the photo, I want to retain the shadows so I can see the texture in the lava, I want to increase the contrast to add a bit of “depth” (3D quality), and keep the highlights from destroying the details in the feathers. Mind you, there’s only so much detail to be had when shooting at a bird 50 yards away, against the light, and with a small sensor. As far as texture, the B&W does a great job of keeping the smaller details. For them interested, I’m using an Ilford PAN F Plus 50 film process with some tweaks of my own. In most of these cases, I think the B&W processing allows a better differentiation of the Bird from the surroundings . . . but, that could just be me. I’m sure you noticed . . .
. . . this bird has red eyes and they pose a bit of a challenge when processing because I don’t want to end up lighting them up like beacons. There’s also red in the algae. Also, the wet algae covering reflects a lot of light. Trying to bump the brightness and contrast without making the green look like crap is also a bit of a challenge. The bird is the primary subject, but the surroundings are also a part of the photo. The red eyes dictate/limit the tweaks you can make in the B&W processing. Depending on filters I choose, the eyes could turn out bright white or completely black. 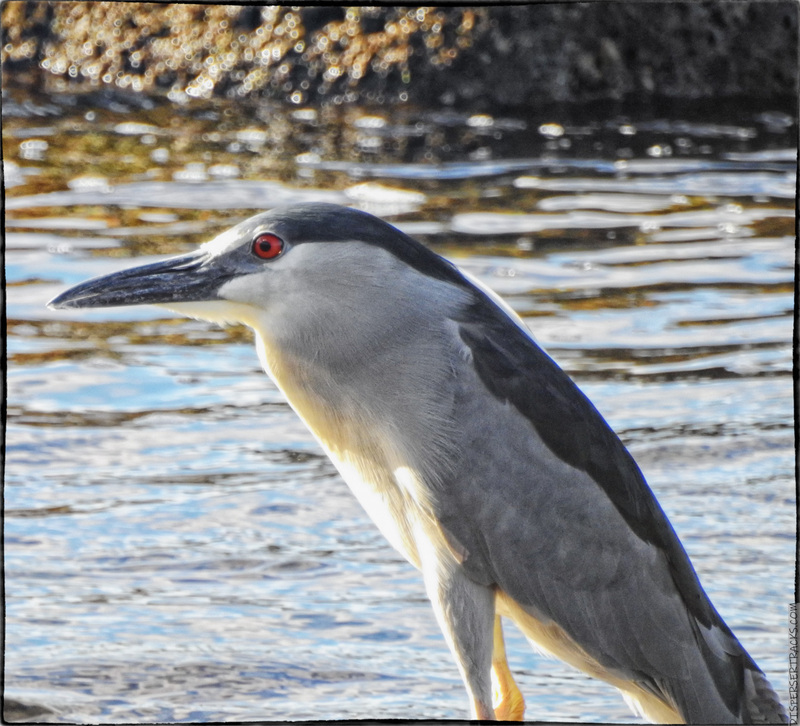 The adjustments have to take into account retaining something reasonable for the red eyes while still trying to enhance the bland gray plumage. 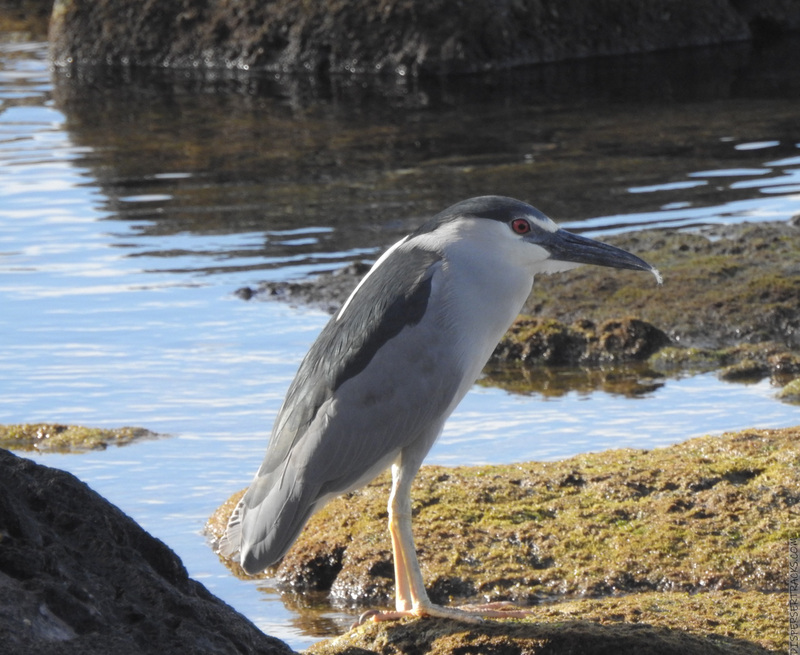 There is some color in the feathers, but not very visible at that angle. But, since it’s there, it can affect how the feathers look when converted to B&W. I’m making it sound like this is some sort of dark magic or difficult process . . . nope! Basically, I throw switches and move levers until I get what I want. Maybe two, three minutes, tops. Again, though, each photo (unless shot the same way and at the same zoom) needs its own processing. Well, “need” is a strong word. My preference for a photo depends on the circumstances for that particular photo. You’ve seen how changing the zoom changes the challenges with processing a photo . . . now, look at this. First, again, look how it seems as if the body is facing us, the legs are looking the other way, and the head looks to the side. It’s like an Escher-thing. But, notice also that now that it’s facing the sun, it’s a different processing challenge. We lose some of the details in the throat feathers (too bright) and the back feathers are pretty much in the dark. But, I mostly care about the eyes. So, I want to keep the eye pretty much as it is (perhaps a tad brighter), tone down the highlights in the throat area, and bring out some of the details of the wings and back feathers. 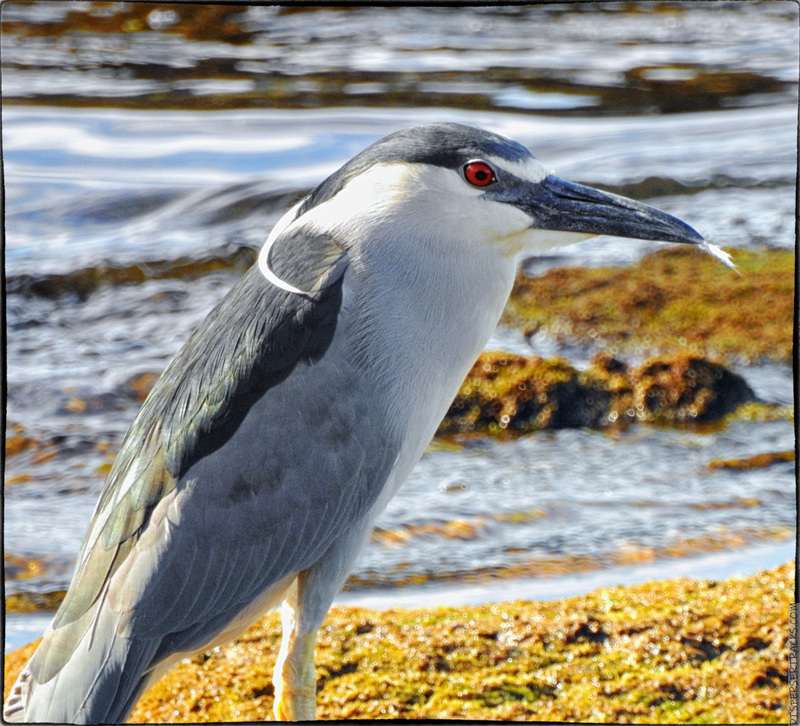 Also, the different metering brings out some of the blues in the water which now give a better contrast to the bird’s coloring. Again, the B&W processed with the same Ilford film option but different tweaks. In this case, I lose some of the differentiation with the water, but I could have added a filter to darken the water. One other comment. Few people use borders . . . I almost always do unless I’m entering a contest (rarely) or have a specific reason for leaving them off. I think borders enhance a photo by setting a clear demarcation between the edge of the photo and the surroundings. Again, that’s just me. Here’s a shot that incorporates more of the surrounding lava . . .
. . . tell me it doesn’t look like the legs are mounted backward. . . I could have gone differently with this one, but here’s my take on it . . . I wanted more contrast in this photo but that made everything around the bird seem too harsh . . . but the B&W came out well as I darkened the water and it brought out a lot of texture. At this point, I should remind readers that WordPress does a lousy job of rendering the photos within the body of the post. If you want a better experience, click on the photo for a larger version. Again, I see a difference, but perhaps it’s just because I examine photos more closely than most. Many of the blog I follow post photos I think could use a few tweaks . . . but I’d just be processing them to my liking and they are not my photos to process. So, just as I don’t pay attention to how others might want me to process my photos, I figure it’s not my place to advise others . . . unless they ask. Note: if anyone is ever interested in seeing how I would process a photo of theirs, send me a copy and I’ll do a short post on it. It’s not likely anyone will take me up on it, but if I have a huge response, I’ll only do a few as I’m pretty busy. If you do send me a photo, send me the original right out of the camera. Be aware that I’m not a professional and I have close to zero experience in anything other than what I like. OK, last photo . . . and the most frustrating one. This was taken at the 2000mm equivalent zoom and it’s washed out beyond my capacity to adjust to my liking. It’s not bad, but less than what I like in my photos. The problem is that I’m getting the reflection of the green from the algae on the white feathers and that results in limiting what I can do to bring out colors and contrast . . . because it brings out too much yellow. Also, because it’s nearly blown out, cutting the saturation for the yellow makes the feathers look funky . . . in short, this is where I stopped after working on it for about ten minutes . . . and I’m not happy with this. I mean, it’s not awful, but I wouldn’t normally show this photo in a regular post. I’d still probably show the B&W version. In fact, I would just show the B&W and not mention that the reason I’m showing the B&W version is that the color version looks crappy (to my eyes). One final comment about that photo . . . I should have looked at the histogram or at least manually bracketed the shot. I knew I was zooming in on a bright plumage. I should have bumped the aperture or the speed or otherwise compensated for the amount of light that was coming in because it’s usually easier recovering shadows than blown out highlights. I could still salvage the photo by spending a lot more time on it . . . but life is too short and no one cares. OK, that’s it . . . here’s the gallery. 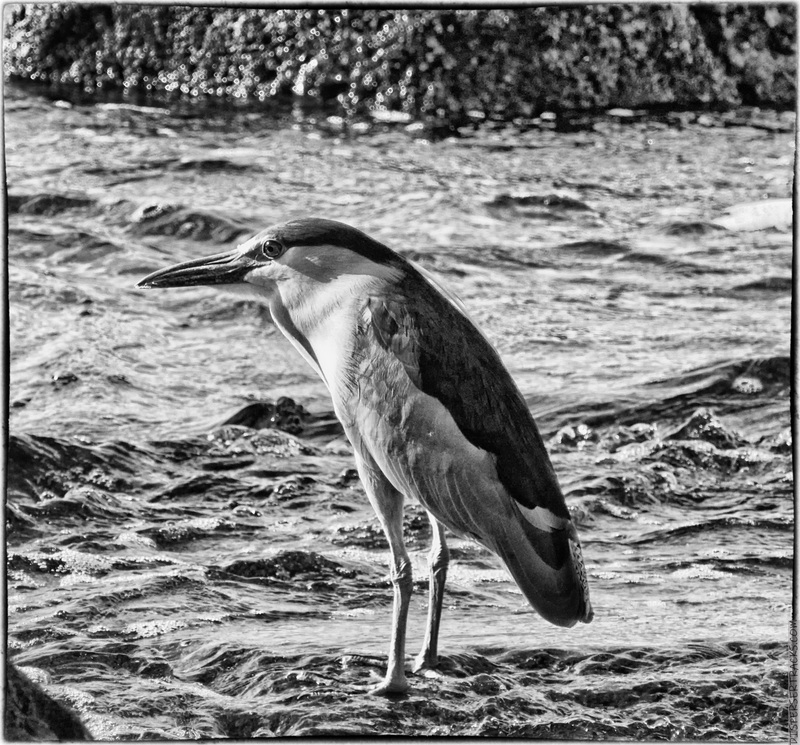 This entry was posted in About Photography, Animals, Black & White, Black and White, DxO Software, Effects and Filters, Feathers, On1Photo, Photo Post-processing, Photography Stuff, Photos, Software and tagged Bird Photography, Black and White Photography, Black Crowned Night Heron, Nikon P900 photos, Photography, photography stuff, post-processing. Bookmark the permalink. I’ve had Color Efx Pro for years and never used it. After seeing your results, I might give it a try. I don’t use On 1 anymore. There are a few recipes in onOne that I still like, but I rarely use them and (currently) almost exclusively use Nik Collection and Lightroom. You might subscribe to these guys as they show features of both Silver Efex and Color Efex that I hadn’t realized were there and had not used. It’s for more extensive processing, but I’m committing to learning the scope of the tools. For me, I’m done upgrading. I don’t do those kinds of extensive tweaks where I go in and adjust only portions of the photos (more time than I want to spend). Also, Nik lets me do that faster and more intuitively when I do want to play with that. Frankly, the cost of the upgrade is not even the issue . . . they’ve pissed me off by still not putting back functionality they removed in the area of batch processing. I find these ‘post-processing’ posts very interesting but maybe a little too much at times for my simple mind. But this time I was fascinated that you were able to process a Black-crowned Night Heron and turn it into a Cattle Egret. Both birds are favourites of mine. Such is the power of post-processing. Actually, I have a source I typically use to identify birds and they have the names of birds below the picture. Last night, I used a different source and they had the names above the photo of the birds . 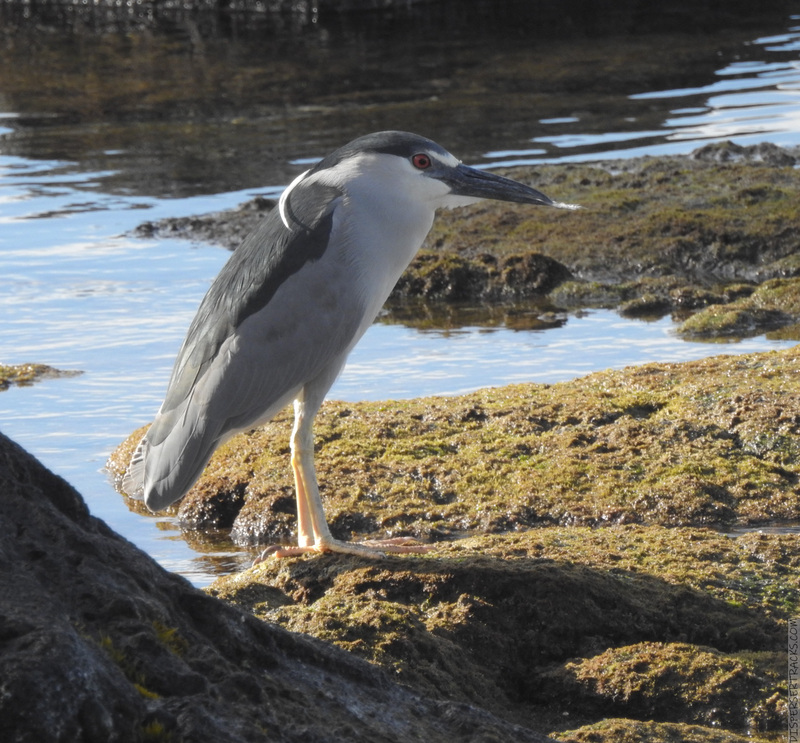 . . and yes, the Cattle Egret was just below the Heron and I didn’t question it or (obviously) looked too closely. In my defense, I was rushed and tired and I might be going senile. But, it’s not an excuse because I too know both birds (lots of cattle egrets here hanging around — you guessed it — cattle). Well I use ‘tired and senile’ all the time. Never apologise! “It’s like an Escher-thing” does describe the “look” of that Heron. When I first started looking at the photos, my mind was trying to figure out its pose, thinking it was facing front, but the legs were not. So, yes, it does play some kind of mind trick. Nevertheless, it’s a beauty and so are both the sharper color and sharper B&W photos of it. It looks like it can turn its head almost all the way around . . . also, the coloring makes it look like you’re looking at the breast when in fact it’s the side. An interesting optical trick. 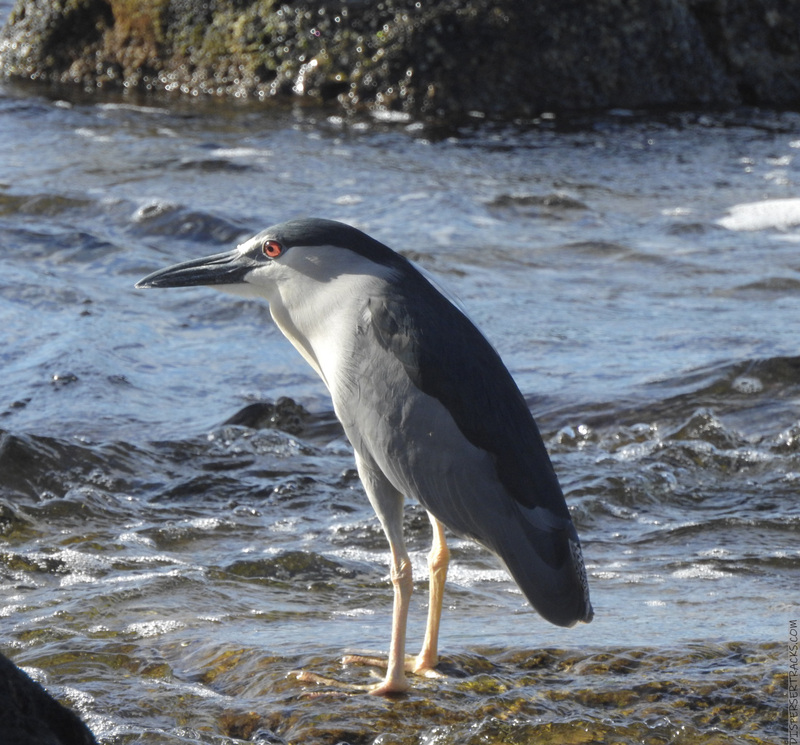 ‘Tis a handsome healthy bird! I not only stared at the bird but, also, at the water. I like the water in B&W. Cool to see your process in processing! I don’t know about healthy . . . in a few shots, it looks like its legs are mounted backward and to the side. But, yes, beautiful bird. I’ve only seen it here once that I remember for sure. I might have seen one flying but I couldn’t be sure. Thanks, Carolyn; the processing part can be tedious and boring but I try to make it entertaining. Although, truthfully, it’s aimed more at other photographers. Not that they should listen to me, but some might find the process instructive. I am so happy to be corrected – it means that someone read the post!
. . . and yet, you strive for accuracy. It’s the dichotomous nature of humans to want happiness but court sadness.